People with disabilities and other challenges face exceptionally high unemployment rates. Customized self-employment (microenterprise development) is a promising option for people who need support to create employment. However, starting a business requires careful consideration and planning. 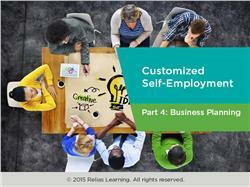 This course, based on the work of Griffin-Hammis Associates, is the fourth in a series of courses called Customized Self-Employment, and is designed for anyone who supports individuals interested in starting a business. Edited by Vickie Vining, this training provides you the information and tools you need to assist individuals in creating comprehensive business plans for their proposed businesses. Through interactive lessons, personalized planning tools, and descriptive examples, you will learn step-by-step guidelines for creating a business plan that can be used to establish and run a small business. 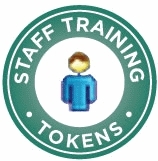 This training is appropriate for a variety of healthcare and human services staff that have basic to intermediate levels of experience with customized self-employment. To complete the course and receive continuing education credits, you must achieve an 80% score on the post-test and complete the course evaluation. Identify the “Four Ps” of the Marketing mix and why they are important. The target audience for this course is: entry and intermediate level Direct Support Professionals; in the following settings: Intellectual Developmental Disabilities.